When an RC vehicle has “waterproof” stamped on the box, what does that really mean? Most people believe that you can drive that vehicle in water without any harm coming to the vehicle or any of its components—it’s waterproof, after all. This claim of the vehicle being waterproof is somewhat misleading. Entire RC vehicles are simply not waterproof. Believing that they are and thus using the vehicle as if it were entirely impervious to water will result in damage. We want you to enjoy your Axial Racing purchase for a long time and not ruin any of your RC investments, so here are the facts, as we see them, on what really is waterproof. We want you to know what can really happen if you take a water adventure too far. Honest information will prevent you from ruining your investment. 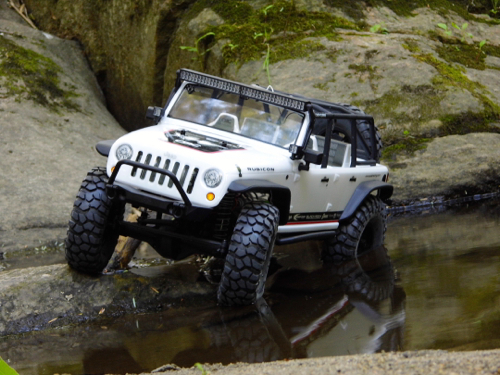 Axial Racing vehicles are scale models of real off-road vehicles and are, as such, intended to be used in a scale equivalent for terrain. What this means is that water crossings that would be appropriate in a full-size Jeep and run no risk of damage would be appropriate, in scale, for your Axial vehicle with no expectation of damage. The general rule is that you can drive a stock full-size off-road capable vehicle in water up to the center of the wheel hubs. The same holds true for Axial vehicles; hub deep is safe for your Axial vehicle. So, if you drive straight through water that is approximately as deep as the middle of the wheels, your SCX10, for example, will traverse the conditions with no concern. You won’t incur damage and won’t require any special maintenance. Commonly, when you buy a new 4X4 truck from a dealer, you think you are prepared to take on any and all terrain. With water crossings, core enthusiasts, however, will tell you that you need various modifications such as lengthened differential breather vents raised off the axle and onto the firewall, waterproofing of the distributor and airbox and, of course, the iconic snorkel. Or, you can learn the hard way. The same is true for surface RC vehicles. Without very specific and specialized modifications, you shouldn’t exceed that general hub-deep recommendation. And, even with extensive modifications, both RC and real vehicles will require maintenance beyond what is normally required if driven in deep water. Receiver boxes that are considered or labeled as waterproof often do an excellent job of keeping the elements out when use consists of splashing through wet terrain and shallow water. These sealed boxes are not, however, truly suitable for protection when submerged in water. When submerged, water can seep in for a variety of reasons. First and foremost, the quality of the seal depends on how well the receiver box was assembled. If the O-ring falls out of position on the main lid or there isn’t sufficient grease on the seal for the servo leads and antenna wire, the box will leak. Water will actually get on the wires and travel right into the box if enough grease doesn’t completely surround the wires where they enter the box. Even a small amount of water can get moved around inside the box and eventually inside the receiver. Again, these boxes provide great protection, but shouldn’t be relied on for submerging your vehicle. Also, keep in mind water depth and time submerged impact how waterproof a receiver works. One of the most problematic aspects of sealed receiver boxes is that it’s next to impossible to see if water has found its way in. Here’s a fun fact. Did you know that water is dense enough to impact the reception quality of 2.4GHz radio systems, which are now the most common type of radio system used in hobby-grade RC? Those guys you see driving their RC vehicles into lakes to show off how waterproof their vehicle is might be in for surprise when they lose signal. While receiver antenna length, battery strength, and other factors play a role, technically you could lose control of your RC vehicle if enough water gets in between your 2.4GHz transmitter and the vehicle. When a manufacturer claims a vehicle is waterproof, a glaring omission is the drivetrain. Transmissions and axles are not waterproof. The bearings may be water resistant (see below), but water will seep in components such as transmissions and axles. These parts may have a tight fit that does an exceptionally good job keeping dirt out, but maintenance will reveal that, eventually, dust or fine dirt gets in. If dirt can find a way in, water certainly can. Not only will water cause corrosion, but it will contaminate the grease. When a vehicle is completely submerged, a surprisingly large amount of water can seep in. Not only is the water bad by itself, it is most likely dirty water carrying abrasive dirt particles with it. Axial bearings are sealed and made out of high-quality stainless steel, but RC bearings are not watertight. The seals keep dirt out and grease in, but prolonged submersion in water will contaminate the bearings, as dirty water will eventually seep in. 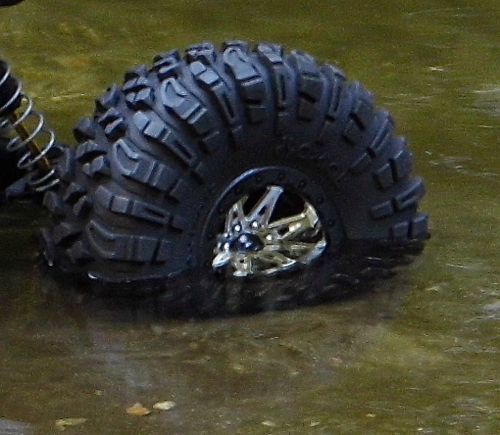 Cruising through shallow water will not harm your Axial bearings and even mud can be cleaned off the outer surface. When completely submerged, however, the water will contaminate and simply gum up the grease. It’s important to note that stainless steel is not rust proof, despite what most people think. It will stain less, but it can still stain. There are also different grades of stainless steel. Odds are you don’t know the grade of the stainless steel used in your bearings, but 300 series stainless steel resists rust better than 400 series. Axial bearings are sealed and made out of high-quality stainless steel, but no brand of RC bearings are watertight. Again, the seals keep dirt out and grease in, but prolonged submersion in water will contaminate the bearings. 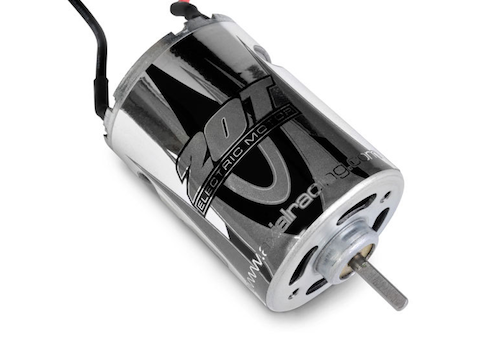 Brushed motors are well known for being able to survive wet conditions. They can even run under water—completely submerged. Brushed motors are frequently said to be waterproof and are actually a great example of the difference between being able to do something and being able to do something without long-term damage. Brushed motors can, in fact, be completely submerged in water and run. Many RC enthusiasts will point out that old school RC racers used to purposely dunk and run brushed motors in water to break them in for higher performance. This is only partially true. The key point to know is that this was done because it rapidly wore or “seated” hard brushes. This technique was used because it was the only option for sealed, non-rebuildable motors and/or because the job of breaking in needed to be done quickly. Water dipping was not the preferred way to break in a motor. Again, water dipping the motor causes rapid wear. Clean water wears down the brushes quickly; dirty water—naturally more abrasive—wears the brushes and scores the softer commutator. Bottom line is a brushed motor can run in water, but doing so undeniably wears the motor out extremely quickly. The bushings (or bearings) will also need to be lubricated after, which requires the motor to be completely removed from the vehicle for cleaning and maintenance. There are two types of brushless motors—sensored and sensorless. While there are some sensorless motors labeled as waterproof, it is highly advised that you do no submerge these motors or even subject them to extremely wet conditions unless you are prepared for and know how to perform motor disassembly and maintenance. These motors use steel shielded bearings, which are not designed to be water tight or even truly significantly water resistant. The stainless steel shields used in most RC vehicles are high quality and well-sealed, but are designed to keep debris out and are not watertight. Sensored brushless are not waterproof due to the sensors that give them their name. Unlike full-size tires, RC tires almost always use foam inserts in place of compressed air. Also, unlike full-size tires, RC tires are almost always vented with holes in either the wheel or in the tire itself. The foam supports the tire so it can bear the weight of the vehicle and the vents allow air to escape and reenter as the foam compresses and then regains its shape. Without the vent, tires would not readily conform to obstacles and would act more like bouncy balls on bumps and jumps than tires. The downside is the vents also allow water in. Water soaked foams are difficult, if not almost impossible, to get 100% dry, and water has proven to significantly degrade the foam and make it deteriorate quickly. On beadlock style wheels, the tires can be disassembled and the foams can be replaced—at a cost. Tires that are glued to the wheels, however, may be a complete loss if soaked. 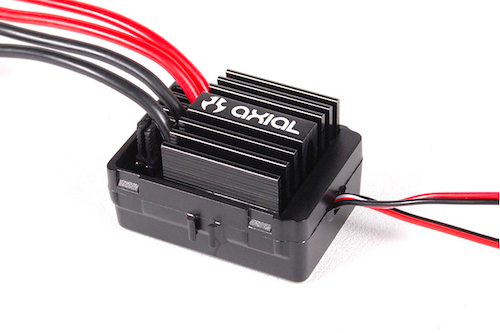 Speed controls (or ESCs), such as the Axial AE-5, and servos are good examples of individual waterproof components. Electronic components are easily damaged by water and when damaged, it is often quickly apparent—the vehicle immediately stops working. Other water damage, in contrast, takes time to manifest. This is the primary driver in declaring a vehicle to be waterproof when only the electronics are actually protected. Speed controls and servos can have their circuit boards sealed—often with an epoxy type material—or have the cases sealed with gaskets, but with both methods more heat is retained. Like water, heat can also damage electronics, so make sure you operate the device within the manufacturer’s specifications. Both NiMH and LiPo batteries function underwater as the individual cells are sealed. Both, however, have exposed tabs that easily corrode. Water does damage batteries. The inside of the cells is well protected, but the exposed parts are not. The battery packs work in wet conditions, but that doesn’t mean damage doesn’t occur. Batteries are also difficult to dry due to their construction. In addition to the components and related issues described above, the hardware holding your RC vehicle together will quickly corrode when exposed to water. This isn’t just an appearance issue; hex hardware will often start corroding inside the hex-shaped head and make maintenance difficult. There are many waterproof rating methods used in industry and very few are stated in RC. It’s worth noting that none are applied to entire vehicles. That is essentially the point. Your entire vehicle is an investment and worth protecting. Even if the box says waterproof, you could be ruining it by driving it in deep water. Below is the IPX rating that only describes water protection. IP stands for International Protection. The X indicates that solid particle protection is not identified. There is a two-digit IP code that does also list solid particle protection, which will be the first digit in place of the X.
IPX-8: Protected against continual water submersion in under water conditions.